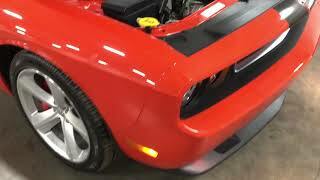 Hi, I am interested in your 2008 Dodge Challenger SRT8 (stock #19GKM17) listed on Autotrader for $29,900. I'd like to get more information about this vehicle and confirm its availability. First Edition SRT8 - 6.1L HEMI - One Owner, 16k miles - Customer Preferred Package 22X - Sunroof - Heated Seats - Original Window Sticker - (Please note: If you happen to be viewing this vehicle on a website other than our main website, its possible that only some of our many photographs of this car are presented due to website limitations. To be sure you access all the photographs, please go to our main website: Garage Kept Motors.) 2008 Dodge Challenger SRT8 Limited Edition - One Owner Garage Kept Motors is pleased to offer this clean, one owner Dodge Challenger SRT8 Limited Edition for consideration. This vehicle was custom ordered through Elhart Dodge of Holland, MI specifically for our client, with his name listed on the original window sticker. It is a Limited Edition because it is the first year of the Dodge reintroducing the present body style. On the dash it reads First Edition 3967 of 6400, so it is a serial numbered car. It is not your average Challenger. What you might not know are some of the finer details. The 2008 SRT8 is the only Challenger to be designated as an 08, and each of the 6400 U.S. cars-they are already sold out-gets a numbered plaque, orange seat stripes, and faux-carbon-fiber hood stripes. Also, the Challenger SRT8 debuts SRTs brake knock back system that ensures the pads stay close to the discs during spirited driving as well as a Performance Features readout on the dashboard that displays acceleration, braking, and handling achievements for the drivers amusement. - Car and Driver The example offered here remains 100-percent stock and has just over 16k original miles recorded. It was finished from the factory in HEMI Orange Pearl over a Dark Slate Gray interior with Premium Leather Trim Bucket seats and HEMI Orange accents. It is powered by Dodges 6.1L SRT HEMI V8 that produces 425hp mated to an automatic gearbox with rear-wheel drive. Noteworthy features include Forged Aluminum SRT Wheels, Performance Brembo Brakes, Navigation, MultiMedia screen, Power Sunroof, Heated Seats, UConnect Hands-Free Communication, SRT High Performance Audio, and Customer Preferred Package 22X among others. It fires on command, dual exhaust sounds heavenly, and is ready for a new home. The car has always been stored in a climate controlled space and comes with a clean CarFax. Non-smoker and no accidents. Preserved with care. Original window sticker, owners manual, and books come with the sale. Be sure to check out all the photos and video on our main website: Garage Kept Motors. Call if interested or e-mail with any questions. Thank you for looking.